Three-year old Bargy tells me my little watercolour and ink sketch isn't quite finished. Apparently the bird still needs a hat? He obviously has an eye for detail. Of course he does! Cant you see that Liesl? Gee whizz. Hmmm maybe birds do wear hats in the winter? All the birds are wearing them. Get ahead get a hat. Hats off to Bargy ! Belated birthday wishes , glad you had a great day . Hmm, Bargy seems to be showing some unexpected fashion sense. I say you should encourage him in that direction, it's rather a good career option for Bargy don't you think? Go on, give the bird a hat. I wonder if perhaps Bargy meant it needed colour on the top of the picture? Hat?? Just thinking outside the square maybe totally off base. Lovely sketch by the way. Ummm.... how about a crash helmet? Just in case he falls out of the tree? Hats are so in this season! Nope. It's perfect the way it is! You madam, are way too talented...a fantastic sewer and a very talented artist as well! 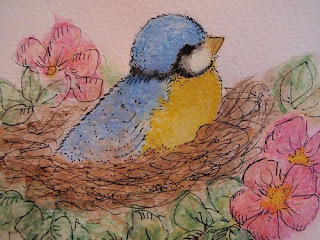 I love your little watercolour and ink bird so much!